« Check out the PhantomX Hexapod/Quadruped Mark-II! Download the 3D files for our Robotic Arms! 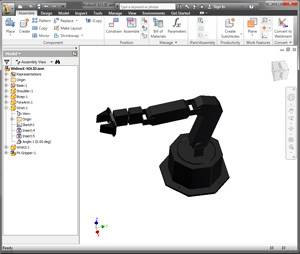 The Interbtotix line of Robotic Arms now all have 3d files in Inventor and STEP formats! These 3D models are great tools if you want to preview our arms or integrate them into your own 3D models. Having the exact dimensions of each arm can save time when your planning a project and help your project get up an running even quicker! Theses files can be used with Autodesk Inventor or any program that can use .stp files. Stay tuned for more 3D models and more resources from the Interbotix Line! This entry was posted on Thursday, March 14th, 2013 at 10:50 am	and is filed under Front Page News, Misc, Product Spotlight. You can follow any responses to this entry through the RSS 2.0 feed. You can leave a response, or trackback from your own site.